Achilles Tendon Injuries in dogs can be degenerative or traumatic and can be complete or partial. Traumatic issues include tears, strains and accidents. Degenerative issues include hereditary predispositions that are associated with particular breeds. The Achilles tendon is used to extend the hock joint. It connects to the “heel” of the pet, pulling the foot up so that the pet can stand on its toes. When the Achilles tendon is damaged, it causes the foot to fall flat – much like humans walk. The muscle attachment of the tendon is called the gastrocnemius muscle. The gastrocnemius muscles are the major extensors of the hock. 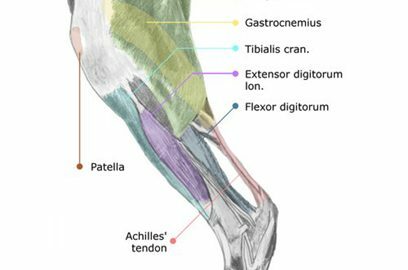 The Achilles tendon is also composed of the muscles that flex the toes, called the superficial digital flexor. The most common presentation is partial tearing of the ligament. Tendon weakening, and eventual rupture, can be chronic and degenerative in many cases. Animals may rupture the tendon while actively running, with what appears to be little obvious trauma. Rupture occurs due to the culmination of a long, degenerative process. The cause of this degenerative process represents long-term wear. In humans, use of fluoroquinolones and corticosteroids has been incriminated as risk factors for tendon degeneration and rupture. Symptoms include mild to severe hind limb lameness, with or without plantigrade (“flat footed”) stance, which is often present in mild or degenerative cases. When the tendon is traumatically ruptured, there is non-weight bearing lameness, flexion of the hock and digits, with the toes appearing curled. Achilles tendon injuries can be seen in any breed; however, it is more commonly seen in large athletic, working and sporting breeds, and usually occurs at 5 years of age and older. Doberman Pinschers, German Shepherds and Labrador Retrievers are amongst the list of specific breeds that are more likely to incur this type of injury. Radiographs, MRIs and Ultrasounds are diagnostics usually performed for a precise diagnosis (and severity) of the injury. Radiographs of the hock may show soft tissue swelling around the tendon and a defect may be visible. In addition, roughening of the proximal attachment area with osteophytes (bone growths) and calcification of the tendon may also be seen. Ultrasonographic detection of a defect in the tendon is diagnostic. MRI is characteristic for rupture with hyperintensity seen in the damaged areas. Surgical repair is necessary, but fraught with complications. When surgery for Achilles tendon injuries is considered, there are many possible complications. The joint must be stabilized for six weeks or more to allow the surgically repaired tendon to heal. The hock joint is very difficult to stabilize and many repairs fail, requiring multiple, costly surgical procedures. However, regenerative therapies are effective and can prevent the need for expensive surgical techniques. Most cases can be managed with regenerative therapies and rehabilitation. While surgical repair is necessary, stem cell therapy or Platelet Rich Plasma (PRP) therapy greatly enhances surgical repair success. Stem cells and/or PRP can be used alone in cases where partial tears are apparent. Regenerative therapies involve one or two injections of PRP into the affected area of the ligament. These injections will require ultrasound guidance for proper placement. If there is also arthritis in the hock or hip joint, injections of stem cells can also be given, requiring fluoroscopic radiography to guide the injections. Regenerative therapy options cure the disease in many cases, without the need for surgical intervention. Physical therapy sessions will be needed after surgical procedures and/or stem cell therapy. A treatment protocol will be developed to include therapeutic stretching and range of motion exercises, as well as laser therapy. Pain medication will be needed after surgical procedures.